Manoir de pedra rústica, com uma entrada e terreno privado, foi construído em 1930 com lareira privativa para pátio exterior e área de estar perfeita para encontros sob as estrelas. Faça s'mores ou aproveite grelhados com familiares e amigos. Villa tem dois quartos com uma cozinha completa completamente mobilada. A sala tem uma lareira romântica, tela plana T. V. com prato e DVD / VHS. Entre no luxo da suíte master com um balcão de mármore e passee no chuveiro. A bela arquitetura de pedra arqueada no pátio inferior está situada embaixo da varanda espaçosa acima, ideal para refeições ao ar livre e enquanto desfruta da beleza cênica do rio abaixo. 100% reembolsável se cancelado com antecedência de pelo menos 14 dia(s) antes da data de chegada. 50% reembolsável se cancelado com antecedência de pelo menos 7 dia(s) antes da data de chegada. The description is completely misleading! Private French Manior, Villa, Le Chateau?!!!! According to Merriam-Webster: Manior - a manor house or country residence in a French speaking country. A villa is a private residence and a chateau is a large country house or a French vineyard estate. The posted photos suggest a private cottage or cabin, the square footage suggests a cottage or small home, the number of people it supposedly sleeps indicate a small home, but nothing could be further from the truth. First there is nothing private about it. It is the middle of three apartments in a three story rock house flanked on either side with other occupied dwellings with separate entrances for each apartment. The description does say "wheel chair inaccessible" but it doesn't mention the 11 steps up or the 11 steps down to gain access to the middle apartment, excuse me the Manior. The only way to gain privacy in the "master suite" is to creatively pull, pin, and lodge furniture and pillows against the heavy curtains which do not adequately cover the many windows of the bedroom. The skillet and the pot I used to prepare our evening meal needed to be scrubbed to remove previous food stuck to them. The wine glasses had to be washed before using as did the silverware. I reluctantly give it two stars only because the balcony was nice and the view of the falls was pretty decent. Quiet, comfortable, & relaxing, with beautiful view from front balcony. Host & family super nice & on site if you need anything!! Would visit again! Beautiful place, very sweet owners. The view of Spring River and the sound of the Rapids is absolutely mesmerizing.I would recommend this to everyone. Place is just paradise tucked away in a small town minutes away from everything. 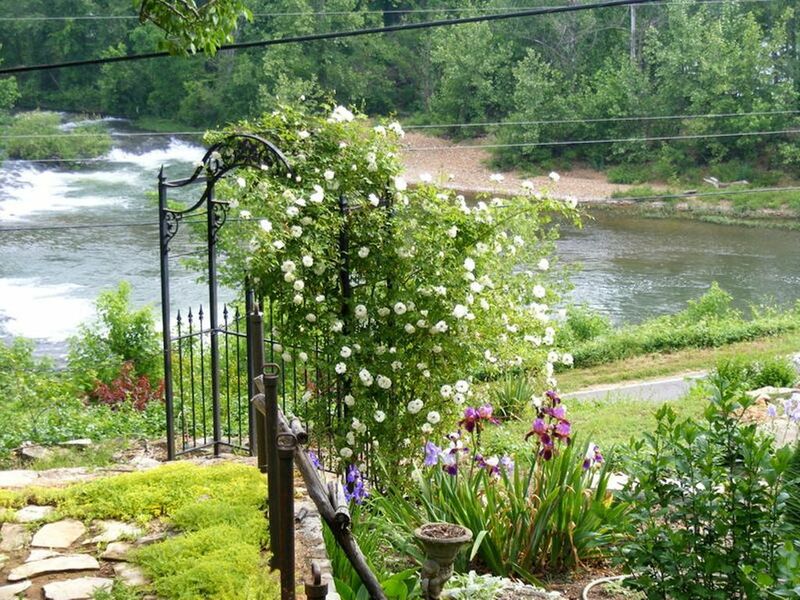 This was such a delightful place to stay with a great view of Spring River. Close to downtown and easy to find. Beds were comfortable and house was clean. There were several outdoor spaces to sit and enjoy the owner's flower gardens and view. Would stay here again!